Washington City Schools Superintendent Tom Bailey recently spoke to the Fayette County Republicans about the upcoming school ballot issue. Washington Court House City Schools Superintendent Tom Bailey recently attended a Fayette County Republicans meeting to hear two high school students make a presentation. Bailey was then asked about the City Schools’ upcoming ballot issue. Bailey indicated that the district is in need of operating revenue to remain out of deficit spending, safety and security, revising the teacher pay scale, and to continue to maintain the buildings. He said that WCHCS has not asked for continuing operating funds since 1991 — 27 years ago. He asked how many of us could live today on the same amount of money as our 1991 income. The funds are needed especially for school teacher retention. He also noted that, “We are 564th in per pupil property assessed values out of 610 school districts.” For comparison, Miami Trace is 68th from the top of the 610 districts and WCHCS are 46th from the bottom. Bailey further elaborated on the funding model. It is 1 percent on only earned income for taxable employee pay, such as salaries and wages, of those living in the Washington Court House School district. It does not tax retiree income, rental income, disability or welfare payments. It is not a property tax so there will be no increase in real estate taxes. From an operations standpoint, Bailey listed safety and security, as well as computers and technology. Since today’s education model has students using more technology for many activities at an increasing rate, that is an added expense over previous teaching and testing methods. Also, the security system needs updating and there are repairs needed on the 10-year old buildings. This revenue will also help keep the school system out of a deficit situation. WCHCS spends millions of dollars less than every other school for district operations in the Frontier Athletic Conference. Bailey concluded by saying that we need to do this for our kids so that they can continue to have a safe and positive learning environment. 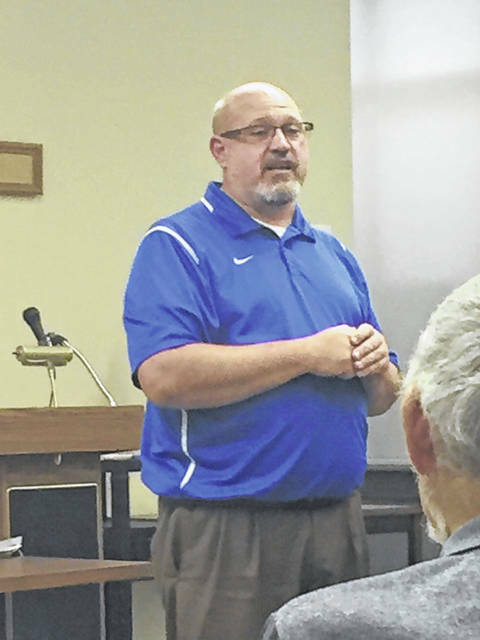 https://www.recordherald.com/wp-content/uploads/sites/27/2018/10/web1_Tom-Bailey-8-9-18.jpgWashington City Schools Superintendent Tom Bailey recently spoke to the Fayette County Republicans about the upcoming school ballot issue.